Is there anything like a summer evening? There is just something that adds an extra ingredient of togetherness, when you are entertaining outside or having a romantic dinner; candles, I think, are that all important element for creating that kind of atmosphere and feeling. Their light draws a little circle around us that focuses our attention on each other and that particular moment. In the wintertime, I still love them in the house for their warmth and ambiance, but there is just something extra-special about bringing them outdoors on summer nights. There are obviously dozens of ways to enjoy candles outside. Tiki torches aren’t exactly candles, but they certainly mark out a space for a party! The thing to remember with any kind of garden torch, be they oil or wax, is that it should only be lit outside and then placed in a bucket of sand or in soft earth, for safety, and then they shouldn’t be moved while they are burning. They need to be well-away from anything else that might catch on fire too, like branches, patio furniture, fences or other structures. They can’t be placed in a group either or used under windy conditions. You may need to put out the flame fully by placing it in a bucket of water, and if you are using one with a wax base, extinguish it when 50 mm or 2 inches are still left, just as you would with any large candle. The same affect, with less a bit less bother, can be had with pillars and hurricane holders. The key to enjoying candles outside is definitely in taking the wind into your decorating considerations. You need a way to protect that precious flame, but still play with your space. Lanterns and large glass holders at different heights are a great way to do that. If you don’t have containers and stands to provide that kind of vertical base, try placing candles on a ladder or step stool. Candles in globes or lanterns can be hung from tree branches, as long as their locations are carefully thought out for safety, or strung over the clothes line. Spaces around a patio, deck or trellis can also highlight particular garden features or close off a space for entertaining. Luminaries and lanterns can be used to create a special pathway to welcome your guests to your home or point them to where you want them to gather. Patio lanterns are so popular, there is even a song about them, so obviously you can’t go wrong there! Just keep in mind that flames and heat don’t mix well with paper or plastic shields. Even mixing natural candle light with their electrical counterparts can liven up your atmosphere, so long as the candles aren’t completely overpowered. Look for something that adds to the twinkle and still lets you enjoy the night sky. Don’t make the mistake of thinking that your candle holders always have to be expensive or fall under traditional lines either. You can have a lot of fun with other heat-safe containers like terracotta pots, small buckets or even metal tart tins. The mixture of metal with wax offers an interesting contrast, in my opinion, and any containers like these are a great way to create a homemade, country look. Jelly jars are another of my favorites. Another great idea is to use tin cans to shield candles from the wind and punch holes in them for a starlight effect. They remind me of pioneer lanterns, without the expense. Providing different textures with your candles creates an interesting centerpiece on an outdoor, summer table. I particularly like floating candles in a large punch bowl, mixed with flowers from the garden. Adding elements of nature, such as driftwood, stones and shells can emphasize a rustic display and celebrate being outdoors. Sand is another note in my repertoire. 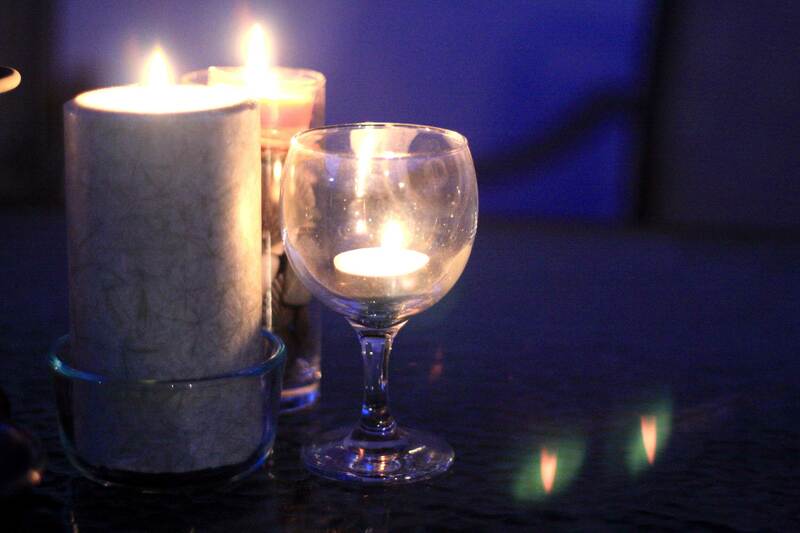 Try placing a tealight in a larger wine glass or vase, surrounded by sand or pebbles. They look great in little niches or together in a grouping. Water and a bit of food colouring and floating candles look really cute that way too, if you want to accentuate the beverage portion of the night. A line or group of candles in shot glasses can underscore the same thing. I particularly like mixing in some of the taller varieties with shorter ones on a decorative platter, a dessert or a cake stand. Safety might not be the first thing that comes to mind when planning a summer party, but mistakes will definitely be memorable and possibly even disastrous. Think out your locations carefully and make sure that they are safely out of reach of children and pets. Never leave them unattended and safely extinguish them at the end of the night. Some candles are for outdoor use only because they contain chemicals to repel bugs or put off other particulates. Always read and follow any safety advice from manufacturers to make candles a fun part of your summer evenings because it’s better to avoid problems completely with a bit of preparation and good planning. That’s just obvious advice not just for candles, but for every aspect of outdoor entertaining. Sand is such a great idea. It’s amazing how different candles can look with different props and holders around them. I have BBQ parties over the summer, and I usually set up some candles. I’ve never tried the sand trick though. I’m going to next time. Thanks for stopping by Stephen!